Financial Services Marketing and Communication: content and integrated marketing, PR, social media: Stop the imposters! The Internet is full of scams and imposters - some obvious, others not so - and as social media booms, it's the next frontier for spoofers and cheats. So how can you be confident that the Twitter account you are following is legitimate? If you are a prominent person or business, how can you fend off impersonators and protect your reputation in social media? There's plenty of tongue-in-cheek spoof accounts out there; @Queen_UK, @BPGlobalPR and @FakeQantasPR to name a few. However, in all seriousness, a fake account could be damaging for you or your business. 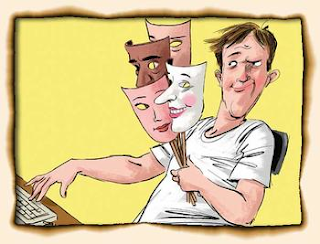 It could result in your customers being deceived or spammed, or humiliation and ridicule. Twitter has a verification program which proactively authenticates the identity of account holders, and identifies verified accounts with a blue badge. The program is focused on very high-profile Twitter users in the areas of "music, acting, fashion, government, religion, journalism, media, advertising, business and other key interest area", and that's the extent of the criteria. You can not request verification from Twitter, and verification has been known to fail. Australian organisations and people who have verified accounts include NAB, Qantas, ATO, Julia Gillard and Joe Hockey. However, there are a number of high profile accounts that are not verified: Westpac, St George, AMP, ANZ, Financial Review and Tony Abbott. With some of the biggest brands in financial services remaining unverified, you can start to appreciate how high the "high-profile" bar has been set. While you wait in hope that Twitter will seek you out for verification, what can you do to protect your online identity? The best advice is to ensure your social media presence is strongly tied to the channels you control - your website, email communication, advertising and products. If your genuine social media presence is strong and prominent, there will be less opportunity for the spoofers to hijack it and leave you playing catch-up. Another way to be proactive is to register the Twitter handles that could most easily be used to impersonate you, and leave them dormant. If you are subject to a spoof account, you can report it to Twitter (like Qantas did). Twitter will close accounts that impersonate others in a way that is intended to "mislead, confuse or deceive", violate copyright/trademarks or infringe any other Twitter rules. However, some spoof accounts are tolerated, so long as they skirt the rules by making their satirical nature obvious. All in all, fighting the counterfeiters requires action by you - keep your social media presence strong, frequent and engaged, and the imposters will have less opportunity to take hold.